Oh yeah, now that’s a sandwich! I can hear my carnivore friends now, snickering over the thought of eating tofu in place of bacon. Whatever, ignore them. WE know that bacon is no longer healthy. In fact, it’s considered a Group 1 Carcinogen by the World Health Organization. 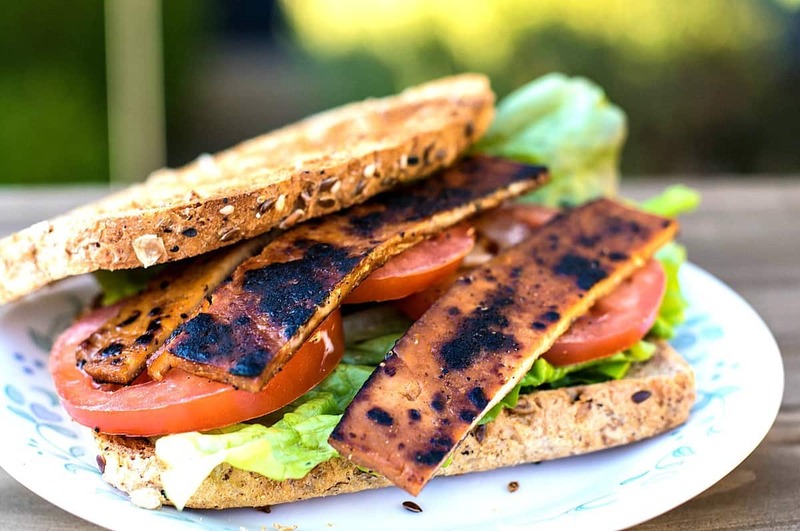 So why do we still want to imitate it like in this Tofu Bacon recipe? Well because for many of us it represents comfort food. It’s something we’ve grown up with, and THAT can be a game changer when it comes down to actually changing your diet permanently. So if I can provide a healthier alternative, with a similar texture and flavor, but still keep you on track to better health…..
It’s pretty obvious people love their bacon. 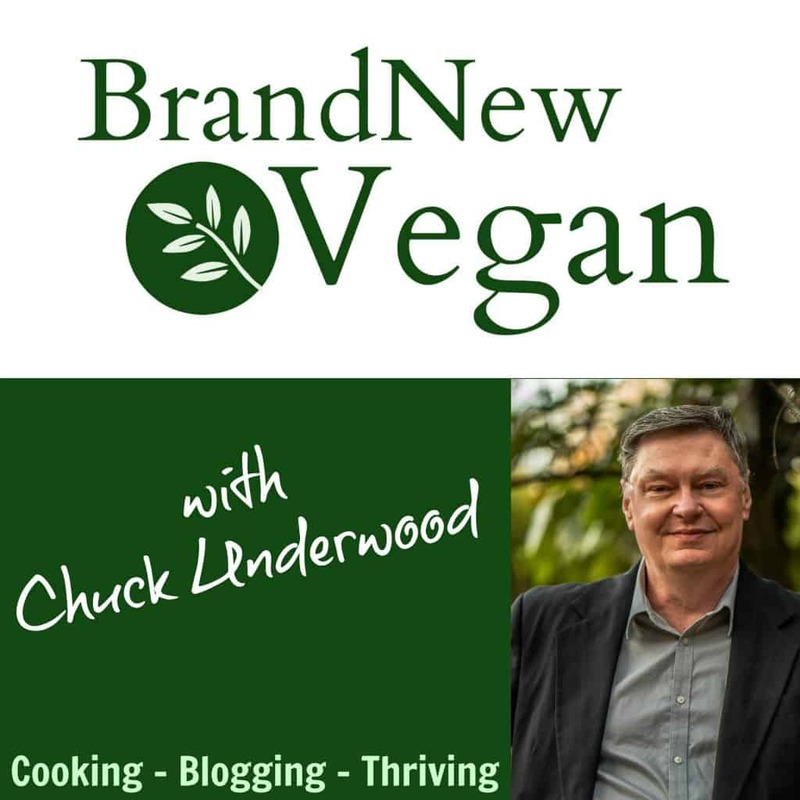 I know since changing my diet, I have seen people make it with a variety of things…. mushrooms, eggplant, even rice paper….. so hey? Why not Tofu? It’s cheap, it’s nutritious, and it absorbs a marinade VERY well. The trick is however, to slice your Tofu evenly. So to do that boys and girls, I suggest one of two things…. Or you can just use a knife if you have a really steady hand…. Any of the above choices will work just fine, but I will say this: if you use a mandoline slicer – please be careful because the blades on those things are RAZOR sharp. Ask me how I know…. The other nice thing about this recipe is you also have a choice in how you cook it, under a broiler or pan-fried. I’ve made it both ways and either one will work fine. So you ready to make this? Ok here we go. Start with a 14oz block of EXTRA FIRM Tofu. Drain all the water out of the package, and then wrap the block in several layers of paper towels. Now place something on top of it to weigh it down and press all the liquid out. I place my block between 2 cutting boards and then set my cast iron skillet on top. Let that sit for a good 15 minutes or so. We want to get as much moisture out of that Tofu as possible. Ok, now that our tofu is good and dry, we can slice it. As I mentioned earlier, a cheese slicer works well, as does a mandoline. Whatever works for you. My slices came out about 1/8″ thick. Place the slices flat in a glass baking dish and now let’s make the marinade. In a small bowl whisk together the following: ¼ cup low sodium soy sauce, ¼ maple syrup, 1 Tbs nutritional yeast, 2 tsp liquid smoke, 1 tsp onion powder, and ½ tsp garlic powder. Pour the marinade over the tofu and swirl it around so everything is covered. Now the hard part, because even now it smells good. Let it sit for at least 15-30 minutes, the longer the better. Once the tofu has marinated, we can either fry it up in a pan, or broil it. If you have a toaster oven – then broiling it is easy. Just place the slices on a baking sheet and broil until browned. Carefully flip slices over to brown both sides. Caution: WATCH it closely. 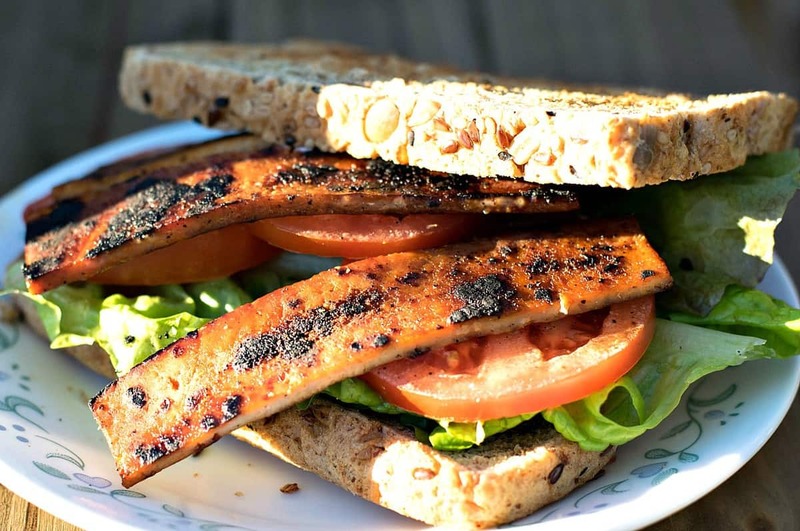 I have had black tofu bacon before because I didn’t keep an eye on it. Just saying. To pan fry: just place the strips in a non-stick skillet and turn up the heat to medium-high. It will look like it’s going to stick, just pour in a little water and it will loosen right up. Flip and turn as needed to brown both sides. 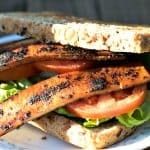 Now slice yourself some tomatoes, pop in some toast, and get ready for a killer sandwich. Oh hey wait a minute…..the mayo, almost forgot! I like this White Bean Mayo I used in my Vegan Potato Salad Recipe. It’s very good, low-fat, and works perfectly. 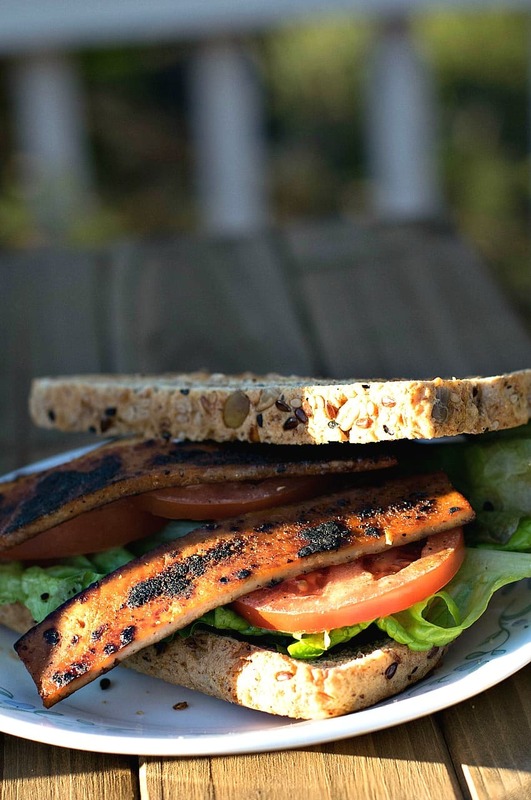 A smoky tofu bacon with just a hint of maple sweetness. Add lettuce, some freshly sliced tomatoes,and a bit of my White Bean Mayo and you got a perfect BLT. Drain tofu , wrap the block in paper towels, and press under something heavy to remove as much moisture as possible. Let press for 15 minutes. Carefully slice tofu lengthwise into 1/8" slices. I have used a cheese slicer and a mandolin with good success. Just be careful. Whisk all remaining ingredients together in a small bowl to make the marinade. Lay the slices of tofu flat in large pan or dish and cover with marinade. Let the tofu marinate for at least 15 minutes, preferably 30 min to 1 hr. To broil: Place the tofu slices on a foil lined baking sheet and place under your broiler. Turn occasionally to brown both sides. Note: Do not use parchment paper. To pan fry: Place the slices in a non-stick skillet and cook on med-high heat until browned, flipping occasionally. If the tofu appears to be sticking, pour a little water in the pan to loosen. Hi Chuck! Yep, very good “bacon!” I did use tamari and marinated for about 30 minutes. I started frying in my non-stick but wasn’t happy with the result so I used my cast iron instead. Because I fried in batches, I put the fried pieces on parchment paper on a cookie sheet in a 300 oven. This allowed them to crisp up a bit more. I would say that 14 oz would satisfy more than 3 people. We had 3 sandwiches generously piled with the bacon and still had leftovers. However! The next morning I did get out the non-stick, added a smidge of vegan butter to the pan and reheated them to have with eggs (I know, I know….it’s my once-a-month breakfast). They fried up nicely and were actually crisper than on the sandwich. Recipe is definitely a keeper! I’ll just use 1/2 of a block if I’m only making sandwiches. Oh yes, the mandolin did a fine job. Thanks!! Got mine at Sur Le Table.